A Record Number Of People Were Displaced In 2017 For 5th Year In A Row An average of 44,000 people were displaced every day, or one person every two seconds, according to a United Nations report. Conflict is the biggest factor driving displacement. 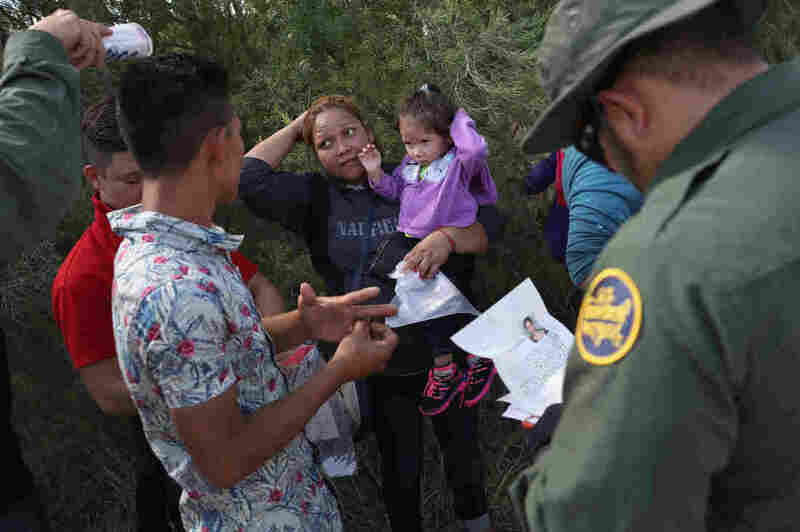 U.S. Border Patrol agents ask a group of Central American asylum seekers to remove hair bands and wedding rings before taking them into custody on June 12, near McAllen, Texas. A record number of people have been forcibly displaced by war, violence and persecution, according to a new report from the U.N. High Commissioner for Refugees. 68.5 million people were forcibly displaced in 2017, setting a new record for the fifth straight year. 138,700 unaccompanied and separated children sought refuge and asylum in 2017, according to the agency. The U.N. says an average of 44,000 people were displaced every day, or one person every two seconds. The agency calculates that one in every 110 people in the world is a refugee,either internally displaced or seeking asylum. The annual UNHCR Global Trends report was released ahead of World Refugee Day on Wednesday. Commissioner Filippo Grandi said a global deal on the management of migration and refugees is essential. "Fourteen countries are already pioneering a new blueprint for responding to refugee situations and in a matter of months a new Global Compact on Refugees will be ready for adoption by the United Nations General Assembly," Grandi said in a statement. "No one becomes a refugee by choice; but the rest of us can have a choice about how we help." According to the report, 85 percent of refugees are in developing countries, and many are "desperately poor." Conflict remains the biggest driver of displacement, and the majority of refugees are fleeing from Syria. However new regions are driving up the numbers of the forcibly displaced, including the Democratic Republic of Congo, South Sudan, and Myanmar. Turkey hosts more refugees than any other country in the world, followed by Pakistan and Uganda. The majority of refugees in 2017 came from Syria (6.3 million); Afghanistan (2.6 million); South Sudan (2.4 million); Myanmar (1.2 million); and Somalia (986,400). Four out of five refugees have fled to countries next door. Much smaller numbers are seeking asylum in the U.S., Germany, Italy, and Turkey. The report says the U.S. received 331,700 asylum requests. The U.S. has the biggest resettlement program in the world, however the number of resettlement places in the U.S. has fallen from 110,000 under the Obama administration, to 45,000 under the Trump administration. Grandi tells Reuters he fears that number could fall even further because of cuts to funding and security vetting. Grandi also expressed concern over the U.S. authorities' separation of children from parents seeking asylum along the U.S.-Mexico border, adding that Washington needs to find ways to manage the flow "without penalizing the people themselves, people who oftentimes have very valid reasons to seek asylum." "Governments have projected an image of emergency, of invasion, and actually, unfortunately many political leaders have capitalized on that to gain votes ... They've built fear to build their electoral bases. And I think that this is despicable and this is irresponsible," Grandi said.